I never worked with ribbon before but I can promise that it wont be my last time! Thought it might be a lil harder to make, the outcome is worth it. Unlike the tiger's tail or the memory wire, the ribbon is very free and has a much more fluid movement to it which can look really nice! 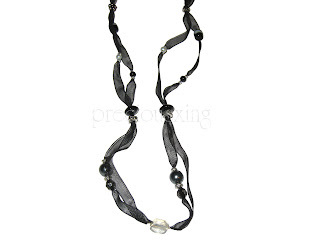 Even when weighed down by heavy beads the ribbon still retains many of its natural curves which is super appealing. For this piece I used organza ribbon which I believe is the easiest form of ribbon to use. Honestly, I'm very tempted to try a ribbon bracelet to see how it would turn out! It was alot of fun to work with! and the wispy ribbon just simply oozes elegance! I did like making this actually, the ribbon was really different to work with and it gives a totally different vibe, much lighter and feathery, when on!